Jeff Moore, owner of Solana Succulents speaks about his latest book Aloes and Agaves in Cultivation. 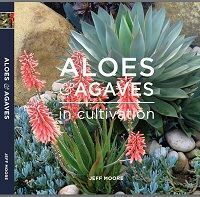 Jeff will walk us thorough aloes and agaves in cultivation in California, from common to rare, with cultivation tips. Jeff has been an aloe collector for over 25 years and has witnessed their increasing popularity and availability - there are many species and hybrids available now that we're almost unheard of here 20 years ago. He's also become a great fan of agaves, even more so after putting this book together. 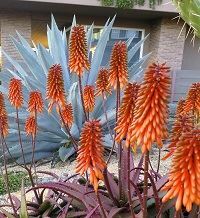 There is a similar appeal with both types, and most aloe folks also like agaves and vice versa. Jeff Moore has owned and operated Solana Succulents in Solana Beach for the past 24 years. Jeff has created many award-winning gardens at the annual San Diego County Fair and Home Shows. Jeff gained notoriety for his 'undersea' themed succulent gardens and has created many unique Southern California succulent landscapes. Jeff will be selling and signing his books at the meeting.